For years, Israelis living in the Hevron region have complained of the activities of gangs of foreign and Israeli anarchists who they say are terrorizing local Jewish communities. 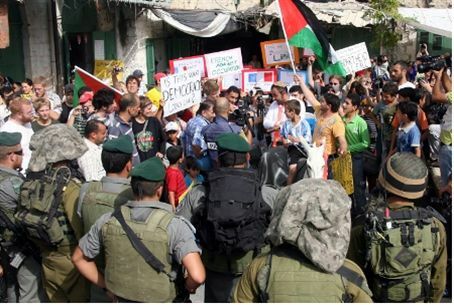 Anarchists frequently enter Israeli towns on the Jewish Sabbath along with local Arabs, they say, and engage in loud demonstrations which regularly escalate into verbal and physical abuse of Jewish residents. Left-wing and Arab extremists have also engaged in serious acts of arson and vandalism against Jewish-owned property and agriculture. These groups speak openly of their wish to ethnically-cleanse Judea and Samaria of Jews, and Israeli residents have complained in the past at the relative impunity with which they are able to carry out their activities. But now, a group of Israelis from the region has decided to fight back. “This is a threat, both regarding public awareness, and an existential threat,” said Yochai Damri, one of the candidates to head the Har Hevron Regional Council. The new group will act alongside the Regavim and Women in Green organizations, both of which are active throughout the Judea and Samaria region. It will be led by Avidan Ofir, a farmer from the Jewish village of Mitzpeh Yair who has been repeatedly harassed by anarchists. “It’s important to us to make Israelis in the area aware of the severity of this problem,” he said. The first step will be to document the problem, including every anarchist-led tour of the region and every incident in which anarchists enter Israelis’ land without permission. Residents also plan to hold their own tours in which they explain their lives in Judea and the impact of the anarchists’ activities. Another step will be asking the Defense Ministry to issue restraining orders keeping out anarchists who have repeatedly harassed local Israelis. Damri called for all Israelis in the region to take part in the new project. “Together we can make sure we all have a better future,” he declared.